An eccentric millionaire [Michael Jacobs] sends a seasoned documentary film crew on a search to find the most legendary icon in the history of rock ‘n’ roll......The King. Is he alive, as many believe? If so, does he want to be found? Is there any credibility to the often ridiculous tales of "sightings"? A tour de force performance by Producer/Co-Writer/Star Mike McSween, Shot & Cut by award winning filmmaker Steven Jacobs, highlight this comedic and transcendent mockumentary about the lengths people will go to find what they’re looking for...and discovering themselves in the meantime. The King always loved to perform as the subtext to King 'n' Me symbolises! The Is Elvis Alive? question has fascinated many fans for more than three decades. Do we finally have the definitive answer in King ‘n’ Me, a documentary film about the search for truth, justice and the American way? Ooops, that’s another show. Rather King ‘n’ Me tells the story of an intrepid group of highly trained film professionals who may just have stumbled on to one of the world’s greatest stories…..that Elvis Presley, the King of Rock ‘n’ Roll, may not have died as claimed on August 16, 1977. Film afficiondas take note, if you are looking for a Spielberg type crafted film saturated with millions of dollars from filthy rich and investors, look elsewhere. However, if you are looking for an offbeat and at the same time sincere documentary (mockumentary) about a documentary team making a documentary (say that fast three times! ), then King ‘n’ Me (funded by millions of Zimbabewan dollars), may be just what you need! When the man called the King (aka John Burrows) finally appears his physical image is a cross between the full fat Meatloaf (not the current low calorie model) and a darkly attired, Gothic Roy Orbison. Serious bit of review: Importantly however, the portrayal is far from an irreverent one; rather it is a poignantly observed rendering which goes to the heart of Elvis the performer and Elvis the person. But despite some familiar mannerisms and speech inflections, is he really that King? And just what is the significance of the FBI badge he carries? And why does he look like Mike McSween? So many questions, and so little time! Reduced to appearing in seedy clubs and smoke filled bars full of ageing hillbilly fans, the burger sodden King finds himself a long way from his days performing in front of Vegas celebrities and 50,000 well attired, screaming fans. But in glorious Hollywood style, there is one last hurrah still to be played out. For the King’s tribute to the King, he graces the stage in a great looking sequined, black jumpsuit, although the early stages of arthritis appear to severely restrict his normally uninhibited hip movements. Clearly, cheeseburgers do not contain enough fish oil or glucosamine. Another serious bit of review: While the script and acting are what one expects of a low budget film, the plot is well defined and the characters are nicely constructed and come alive colorfully on screen thanks to some great direction and non-drug affected acting performances. Michael Dasch is delightfully obnoxious as the “B” grade TV host/journalist Cameron Camerion (he may strike it big in South America! ); and Mike McSween steals the show in his many guises, including the King and Numerology Harry (the latter character with a suitably annoying Adam Sandler type voice). McSween deftly inhabits each of his different characters, displaying an impressive chameleon like presence and an acting flexibility which traverses a full range of emotional anticipation and angst. Others of notable note in the notorious cast are Rob Ashkenas (of the Ashkenas family) as the (inebriated) Director (i.e, in the film, not the film's Director) and Michael Jacobs as promoter, Joey Argentina (although I don't think he's actually from Argentina, but I guess stranger things have happened). 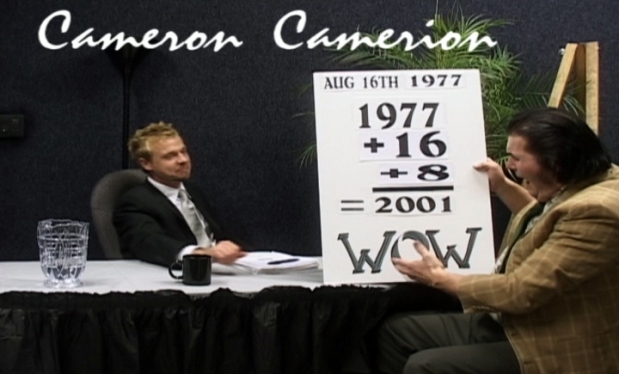 Does Cameron Camerion have trouble remembering his name or does Numerology Harry have a problem with numbers? Very serious bit of review: The incidental music to King ‘n’ Me is strong with Richard Strauss's iconic 2001 (Also Sprach Zarathustra) theme featuring several times while the two featured songs, Blame and Insane are stand out rock recordings!!! Blame has a slow, bluesy feel while Insane’s melody is incredibly infectious. These sublime songs are performed by Heavy Metal group, 1,000 Pounds of Thrust (featuring Mike McSween – this guy is literally everywhere and he probably has his own range of custom made Gibson-McSween guitars). Note well: These are seriously great recordings!!!! I recommend you watch the closing credits closely! It’s amazing who was involved in production of King ‘n’ Me – a veritable pot pourii of ‘has been’ ETA’s, acting rejects and ghetto physicians. The trouble the producers must have gone to in engaging these celebrities is most commendable! New Age - Political issue: The right wing promotion for King 'n' Me also said it was 'transcendant'. I didn't know what this meant so I've chosen to ignore the rhetoric as I wish to remain superior to the film's marketing team. An even more serious bit of the review: Probably, King ‘n’ Me has its greatest similarity and strength with the little known film, Eddie Presley. Both reflect the essential impact of Elvis and enduring interest in him. 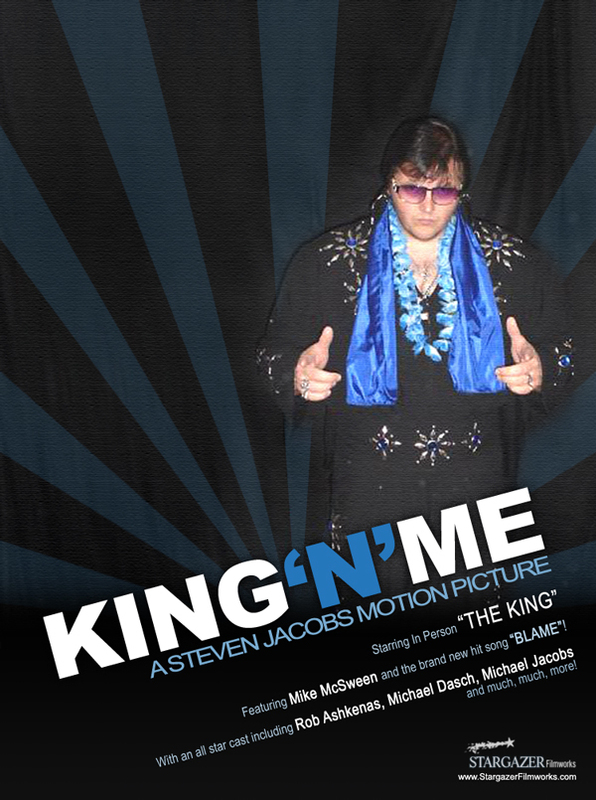 In King ‘n’ Me the “King” character reflects both Elvis’ love of his fans and for performing, and these elements shine nicely above the underlying humor of the film (which this reviewer has chosen to emphasise). 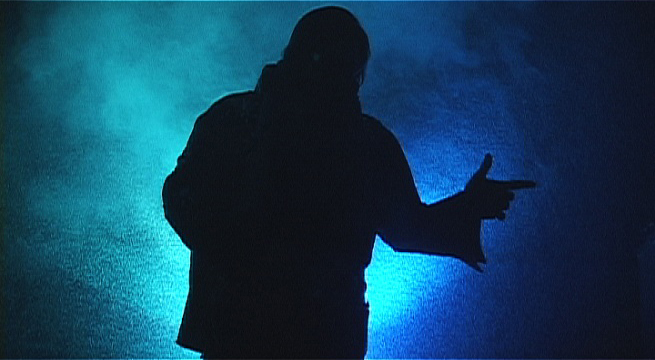 Scrumptiously scripted and pungently produced with just the right amount of McDonald’s flab, King 'n' Me is a rollickingly delicious, deceptively light hearted recipe with a powerfully potent core, all just waiting for ravenous Elvis fans to devour. Could King 'n' Me have been better? Cross it with the obvious physical stimulation of Anatomia (see below) and I think the producers would be standing in line (with hands strategically cupped) to receive ‘golden boy’ Oscar! (What do you mean Oscar De La Hoya doesn’t like documentaries?). King 'n' Me is definitely a case of tear open the popcorn, sit back, and enjoy........and at all times have your tongue planted firmly in cheek (the cheek of your choice)!! It is an offbeat but most rewarding ride which offers a multi-aspected interpretation of the King! Verdict: King ‘n’ Me is a breakaway indi (read: independent, i.e. not from India) film in the broad vein of Bubba Ho-Tep; Eddie Presley; Elvis' Grave and Elvis Killed My Brother. Video Quality: Excellent (clear and free of artefacts); occasional dark lighting not a significant issue. The film is best viewed in 4:3 aspect ratio (or if you can’t do that, use a TV). Audio Quality: Variable; at times the audio sounds deep or muffled, like it was recorded in a cavern or wind tunnel. To listen, we recommend you turn up the volume (or your hearing aid). Subtitles are not provided for the hearing impaired or those from an Australian speaking background (Queenslanders excepted). Producer: Someone called Mike McSween. 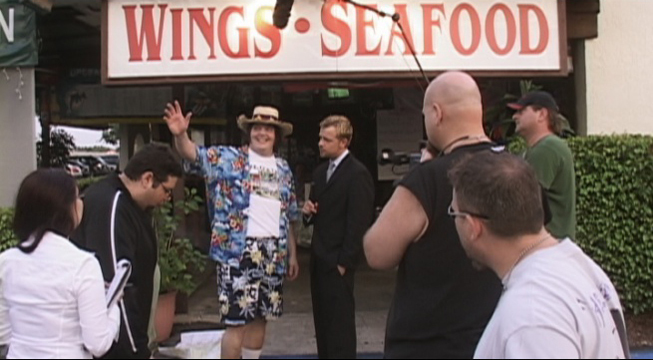 Location shooting: King ‘n’ Me was filmed in and around Florida and carefully avoided the 'mean season', even if it couldn’t avoid McSween and obviously couldn't afford Kurt Russell! Talent: Yes (so we're told). Running Time: 91 minutes (luckily the disc doesn't run that fast so most people will catch up, but leave a little bit early just to be sure). DVD Extras: The commercially produced DVDR comes with the latest Scene Selection technology (which is great when you want to quickly revisit your favourite scenes) and two film previews - ‘e’ and the world’s sexiest silent film, Anatomia. Price: If you wish to believe the above link to Amazon, it costs $15.00 plus some money for handling and postage. Most Important Note from EIN (possibly based on an unfounded rumor) - A Case of what could have been if it hadn't been for the Audience: The producers of King 'n' Me had considered releasing the film in 3D, but decided against this as they realised most viewers could not count to '3' let alone get to 'D' in the alphabet! * Anatomia won Best Local Short at the 2007 Miami Underground Film Festival and was later an official selection of the Palm Beach Film Festival. Just as good a Borat! Funny all the way through... Great characters cool music, if Elvis was found this is what he would sound like, you know what I mean?... I think you do... good indi film, fun and fun to watch! I have been waiting for my story to be told with compassion, sincerity and class. I'm just not sure when that will happen, but until then King 'n' Me sets the benchmark.